Why does GN Netcom call their GN 2100 Series the next generation of professional headsets? Just look at the GN 2125 NC headset. For noisy environments, GN 2125 NC headsets feature the DuraFlex-II™ flexible boom, for exact microphone positioning, and a noise-canceling microphone, to filter out ambient noise. Matched with a sleek, lightweight design, the GN 2125 NC is a combination of clarity, comfort and convenience that's really a breed apart. 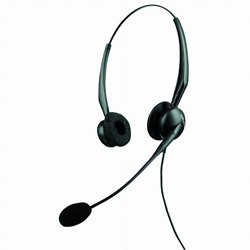 The GN 2125 NC headset is lightweight, very durable, and extremely comfortable, even if worn all day long. A click-stop headband provides a customized fit and pillow-soft ear cushions rest gently over the ears. This model is a binaural headset, with two earpieces which reduce background noise and make it easier to hear softer voices. The GN 2125 NC headset requires a GN 8000 amplifier.